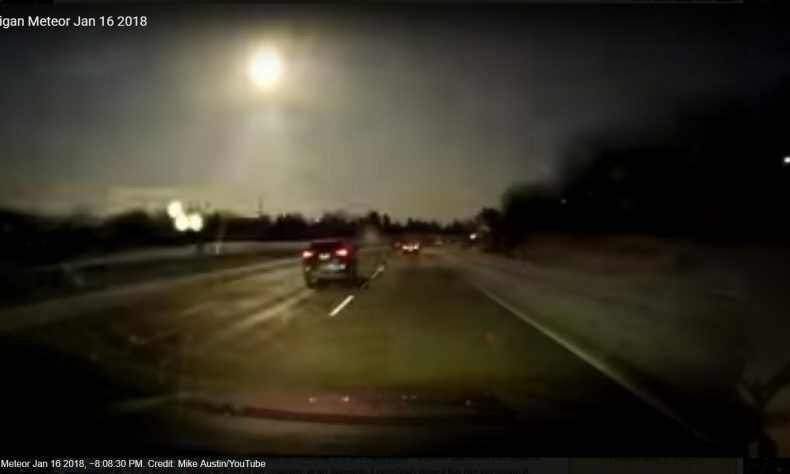 ANN ARBOR — On the night of Jan. 16, a meteor burst in the skies over Michigan, producing a fireball that was seen by people across seven U.S. states and in the Canadian province of Ontario. More than 600 sightings of the fireball were reported, along with reports of shaking and thunder-like rumbling. Numerous fragments were found on frozen, snow-covered lakes in the days after the event. As exploding meteors go, this one, which is known to researchers as the Michigan bolide, was relatively small and unremarkable. But it happened to pass over an unusually diverse and dense suite of sensors — cameras, seismometers and infrasound microphones — that recorded the burst. As a result, the event is providing scientists with a bolide bonanza: a rare opportunity to use all three sensor types to pinpoint the time, location and height of the explosion and to calculate the amount of energy it released. Researchers from the University of Michigan and the Scripps Institution of Oceanography report their multidisciplinary study of the event in a paper published online Aug. 21 in the scholarly journal Seismological Research Letters. The findings should help researchers refine their understanding of the 2,000 or so similar-sized and larger bolides that pass through Earth’s atmosphere each year. Those insights, in turn, could advance their understanding of the threat posed by larger near-Earth objects. “This event was unremarkable in the sense that small fragments of this size come into the atmosphere every day, pretty much,” said UM seismologist and study co-author Jeroen Ritsema. The first author is Michael Hedlin of Scripps. “But the fact that it went right over us and burst close to these seismic stations and infrasound microphones, that’s unusual and fortuitous. And it makes this event scientifically interesting,” said Ritsema, a professor in the Department of Earth and Environmental Science. The Michigan bolide was streaking through space at more than 30,000 mph when it dove into the upper atmosphere at a steep angle. The rocky chunk of space debris exploded in the lower atmosphere, about 37 miles west of Detroit, at a height of 14 or 15 miles above the ground, the researchers calculated. They estimated that the amount of energy released in the explosion was equivalent to 2.2 tons of TNT. For comparison, the atomic bomb dropped on Hiroshima exploded with an energy of about 15,000 tons of TNT. 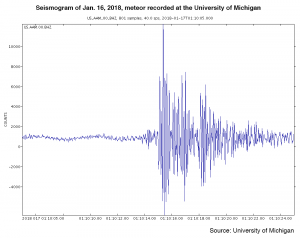 Though it was a relatively small event, the burst was detected by seven seismic stations in Michigan, Ohio and Ontario, including the Ann Arbor seismic station on the UM campus. Data from four of the seismometers was used to constrain the location and height of the burst. A lightning-mapping instrument on NOAA’s GOES-16 satellite recorded the burst at optical wavelengths, as did numerous ground-level cameras in the region. And very-low-frequency sound waves were picked up by more than 50 infrasonic microphones in a regional network of seismic stations called the Central and Eastern United States Network. The infrasonic microphones and the seismometers provided a location and time for the event that was consistent with data from the optical sensors. Ritsema said the January event marks one of the few times that all three of these technologies — optical sensors, infrasound microphones and seismometers — detected the burst of a small bolide. The other authors, in addition to Ritsema and Hedlin, are UM’s Eric Hetland and Catherine de Groot-Hedlin of Scripps. The work was supported by grants from the National Science Foundation. The Seismological Research Letters paper is titled “A multidisciplinary study of the 17 January 2018 bolide terminal burst over southeast Michigan,” doi: 10.1785/0220180157.